German authorities are trying to identify the suspects and motives behind a mob assault on eight Indians in a small eastern German town. All eight Indian men were injured in the attack, in which about 50 Germans chased them through the streets of Muegeln after a fair early on Sunday. Four assailants and two police officers were also hurt. Witnesses say there were racist chants during the attack. The Indians fled to a pizzeria before being rescued by police. Muegeln mayor Gotthard Deuse said that "if this was a far-right incident, then the assailants did not come from Muegeln". 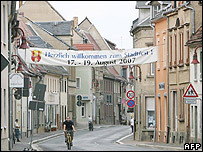 Eastern Germany has seen sporadic racist attacks on foreigners since German reunification in 1990. Most of the Indians were traders selling goods at open markets in the region, said a police spokeswoman quoted by the Associated Press news agency. According to some witnesses quoted by police, the slogans "Foreigners out!" and "national resistance rules here!" were chanted during the assault. The deputy speaker of the German parliament (Bundestag), Wolfgang Thierse, warned that such incidents could harm Germany's image abroad. "The worse Germany's reputation is, the less people will come here - people we need for our progress and welfare," he said.